Dreams of a white Christmas may not come true this December, according to initial forecasts for the month ahead. After what meteorologists believe to have been one of the top 10 warmest Novembers on record, the temperature pattern in December will likely shape up similarly, the National Weather Service said Monday. Forecasters are expecting it to be “exceptionally mild” for the first half of December, according to the NWS’s office in Mount Holly, with the possibility of a pattern change during mid-month, leading to some moderation in temperatures. 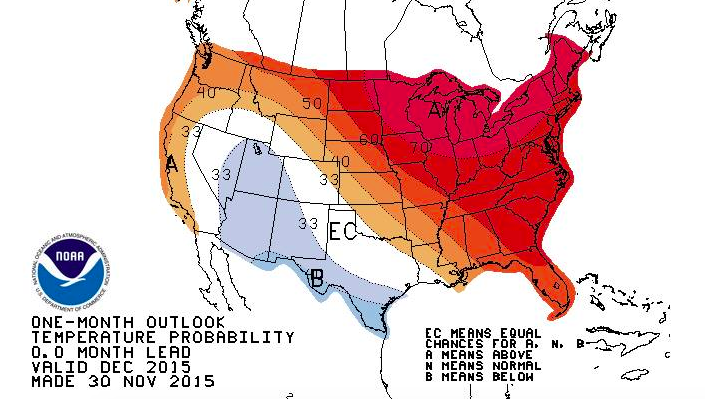 “Overall, probabilities for above normal temperatures exceed 60 percent,” the office said. In addition to the general weather pattern, NWS forecasters cited the ongoing El Niño, among the strongest on record, for contributing to their outlook for above average temperatures. Even with the potential for a mid-month variability, the chance of reversing the overall warm temperature anomalies is “exceedingly small,” the agency said. Additionally, the forecast calls for “slightly wetter” than normal in the northeast.